Saudi Arabian Oil Company (Saudi Aramco) and Hyundai Heavy Industries Holdings today announced that they have reached an agreement for Saudi Aramco’s subsidiary, Aramco Overseas Company (AOC), to purchase a 17 per cent stake in South Korea's Hyundai Oilbank, a subsidiary of Hyundai Heavy Industries Holdings. The investment is valued at approximately $1.25 billion. 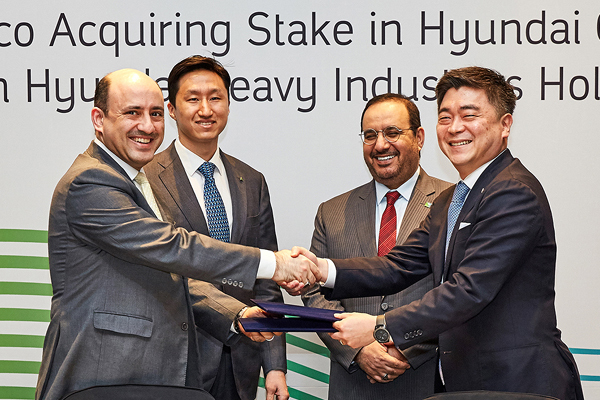 AOC’s’s investment in Hyundai Oilbank will support Saudi Aramco’s crude oil placement strategy by providing a dedicated outlet for Arabian crude oil to South Korea.